About two weeks ago, I began a road trip throughout California and Oregon and assured everybody I’d be bringing back ghost stories to share with the readers of this blog. Unfortunately, during my travels, I found very little in the way of horror. Whether it be I was too busy dancing about other people’s living rooms, or whether there was very little to find, is difficult to say. The haunted and horror I was able to find was predominantly limited to a supposedly haunted theatre that had been turned into a bustling pub, and a haunted college that we were unable to locate — both of these stories having very few and hardly intriguing details. However, not one to refuse the opportunity to tell a good story, I decided to do some research on my own town, Salt Lake City, and some enticing ghost stories that circulate locally. Without further ado, here are some of the Salt Lake City ghost stories that I found the most exciting, and the most terrifying. Once a playhouse, the Capitol Theatre was sold to the mayor in 1927 and, with the rise in motion pictures, the theatre was turned into a movie theater — with the occasional stage production from time to time. In 1949, the theatre caught fire and sustained only one casualty: a seventeen year old boy who had been rescuing others. This boy perished in the fire, but his spirit lives on. Nowadays, they call him George, though this wasn’t his real name. George has been known to pull plugs, move lights, slam doors, and mess about with the elevator. While he isn’t considered malicious, pranks are not unheard of from him, and he seems especially active during performances of the Nutcracker. On one such occasion, the stage lights refused to turn on, despite the power source and lighting program being active. The stage manager was seen to have stormed onto the stage and shout “George, knock it off or I’m going to have you exorcized!” And, before he knew it, the lights were working once more. But the theater isn’t the only place in which the dead are rumored to remain. Just around the corner, for example, houses a dramatic incident in history that left the entire city shaken. After her husband killed himself via carbon monoxide poisoning, a wife and seven children were said to have believed that they were unable to function as a family without following him. 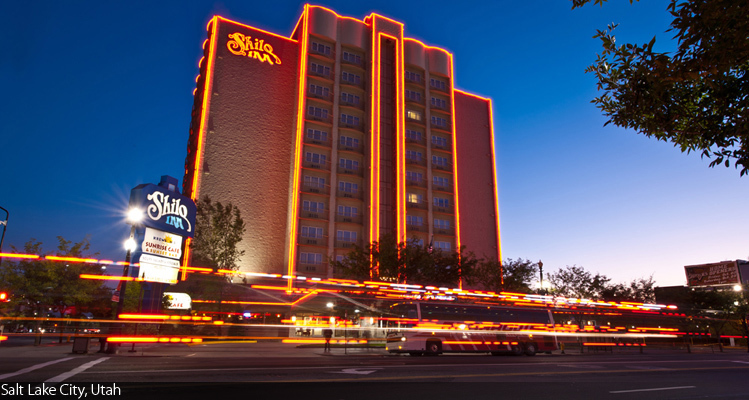 As a result, the mother took her children to what is now known as the Shilo Inn in Salt Lake City, and while the elder children threw themselves off the balcony of the eleventh floor, the younger children were thrown off by their mother. When all the children had hit the ground, the woman followed suit, taking her own life by taking the plunge. Only one of the children survived, but the brain damage from the impact caused her to be restrained in a wheelchair the rest of her life. To this day, a woman and a child haunt the hotel. Often, the pinball machine will activate itself. Meanwhile, light bulbs will unscrew, tools will move about, and sometimes tricks will be played on maintenance workers. Disembodied laughter from a woman is often also heard on the first floor, coming from the pool area, and on the eleventh floor, people will often hear the screaming of children, usually along the lines of “Mom! Don’t make me do it!” While these ghosts don’t appear to be malignant, in 1997 a grown woman drowned in the pool, and many link this to the ghosts residing there — though nothing conclusive can confirm this link. But not all hauntings in Salt Lake revolve around this pinpoint on the map where the Capitol Theatre and the Shilo Inn can be found. Just down the street, a few blocks away, holds a troubled past and an intriguing present. 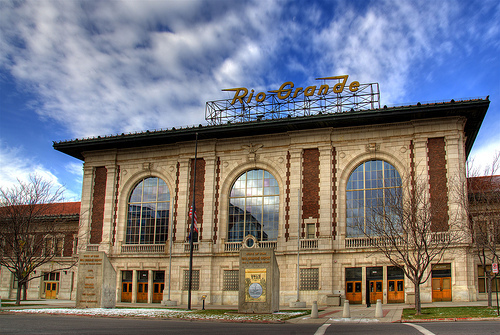 While nowadays, this building houses a fantastic Mexican restaurant and the headquarters for the Utah Historical Society, when it was first constructed, it was meant to be a railway station. In the early 1900’s, a woman arrived via train to visit her fiancé, but the two of them abruptly got into a fight. In a fit of anger, the man threw the engagement ring onto the tracks, and after it flew the woman, desperately trying to retrieve it back. In her mania, she didn’t see the oncoming train until it was too late. Nowadays, what’s known as the ‘Purple Lady’ is said to haunt the women’s restroom of the restaurant — assumed the location she was about when she died. Along with the purple lady, a number of other strange occurrences happen here. At one point, a maintenance worker had thought he’d seen the lights flickering downstairs. Upon investigating, an entire party full of people disappeared. Another occasion comes from a security guard who heard phantom footsteps upstairs. When he went to look, he found nobody. One night, he set a trap and sprang it when he heard the footsteps, but to his surprise, he caught no one. He did, however, feel something brush past him, and hear the footsteps grow closer and pass him by. While the reality of ghosts is a controversial topic, one thing can be certain about ghost stories that haunt even the most trivial places of the world: Whether they’re true or not, they provide a good deal of entertainment and an excellent conversation starter. In fact, did you know Halloween Love’s very own forums has a section all about ghosts and monsters?